Greetings from Kauai, friends. I’ll be here for the next 10 days or so, and I’ll try to bring you some reviews of some not so common Hawaiin candies. Yes, I know, life’s tough. First up, the not Hawaiian at all Blue Razamatazz Sour Punch Straws. 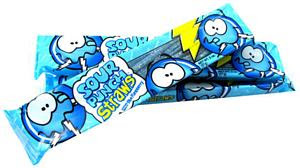 On paper, these should be right in my wheelhouse-chewy, sour, flavored like “blue”, which is ridiculous….overall, a pleasure to a 5 year old or a developmentally challenged 39 year old like moi. Last night, sitting around the TV with the family watching a certain film that won all the Oscars including Best Sound, and not being able to understand the dialog (ironic? ), I decided to bust these out.Mediocre. Not that chewy, not that sour, and the blue raz flavor has a really weird note to it. Slightly medicinal, heavily artificial, it just tastes weird. When you’re chewing it, you’re not conjuring images of fruits of any kind, you’re just…chewing a weird little mushy spoogy thing. Interested? Didn’t think so. Some things are best left to the tots, I guess. Not for me. Bottom Line: In a world of sour candy love, there just isn’t any point in reaching for these. I won’t again. I thought there was a reccesion going on! What are you doing in Hawaii eating candy? Wait, is your last name Madoff? Yeah, these were terrible. I grabbed one on my way downstairs and the taste made me sick for about an hour. And in no way did I think it was blue raspberry. I thought it was … hm. Anyway, it’s a serious pass.